If you're considering trapping opossum chances are you have a nuisance pest invading your home or living under your deck. 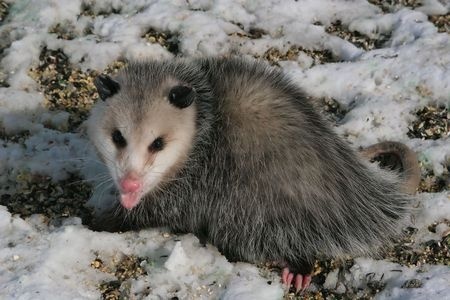 Unlike chipmunks and rabbits, most people don't associate opossums with being cute and cuddly. Opossums have a long snout with a pink nose on the end and little black beady eyes. These features, along with a long rather hairless tail, make many people think the opossum is related in some way to the rat. Combine these distinctive, some may say ugly, physical characteristics with the opossum's natural predilection to hang upside down and you get an animal that a lot of people just don't like. Sort of like a furry bat or rat. In reality, the opossum is of no relation to the rat nor the bat. In fact, they're classified as North America's only marsupial which means it's a closer relation to a kangaroo than a rat. Opossums earn some of their bad boy image from their behavior. When an opossum is threatened or feels cornered, it will often open its mouth and produce a loud "hiss" noise. In the past, baring teeth and hissing has led folks to believe this was a sign of a rabid opossum. This inaccurate assumption has not done much for opossum tolerance. So why would anyone want to tolerate opossums anyway? Well, they really aren't bad critters to have around your yard. They eat various bugs that can be a detriment to your garden, such as snails, or others that are unwelcome in your home, like cockroaches. They have even been known to eat small rodents like mice. In addition, if you have fruit trees in your yard, opossums will gobble up the fallen fruit so you don't have to deal with an onslaught of fruit flies and bees. The troublesome issue with opossums, however, is they like to burrow under porches or garages. 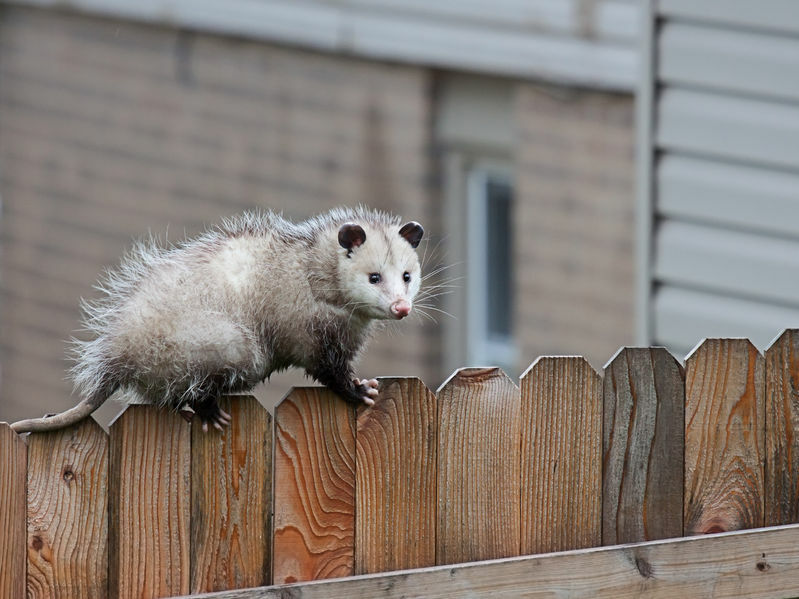 The best way to prevent an opossum family from moving in is to secure or block any areas that look appealing to an opossum. If you're unsure if an opossum has moved in, very loosely fill any suspect holes with dried leaves or dirt. If an animal is living there, it will dig its way out of the hole. After a few nights, if there is no movement you can fill in the hole completely. Mother opossums take their young with them, so you don't need to worry about suffocating the babies. If opossums continue to try and inhabit your deck or porch space, surround the opening with a thick mesh. Burry the mesh so that any animal attempting to enter can't simply dig under your protective barrier. If a opossum gets into your garage or home, either through a pet door or another opening don't worry. Opossums tend to be harmless, non-agressive animals. They were most likely attracted to the space because they smelled food. There are a number of easy ways to remove an opossum from your living space. First, close all other doors leading further into the house. The only door open should be the one leading outside. Next, use cat food or sweet fruit to make a trail leading the animal outside. No traps are needed if you can leave the door open and wait. Keep in mind that all wild animals do present a danger, although the opossum tends to be rather docile and disease free. If this doesn't work, try placing an empty garbage can in the middle of the room. Create a staircase of sorts out of blocks of wood or other similar materials that leads into the garbage can. Again, use fruit or cat food to lure the opossum into the can. Once it's in, it will not be able to get back out. Place the lid on the can and release the animal outside. Typically, opossums will not return to the same place if they have not found food. They tend to "keep moving." Keeping a tight lid on garbage cans, not leaving food in a cat's bowl all day long and securing your home with mesh are all easy preventative ways to keep opossums outside and away from your house.